Caldecote A v Renhold Reserves. Picture: David Kay. The visitors extended their unbeaten run to nine games in the process and moved into fourth - becoming serious title contenders themselves. Nick Thomas and Jack Boyd hit the vital goals against a lone home reply via Daniel Stafford. For second place AFC Oakley M&DH it was also an extension of their unbeaten run to nine – and win number five on the bounce – when second half strikes from Nathan Aulsberry and Hai Wood took them to a 2-0 victory at Shefford Town & Campton. Now in third spot are Wilstead who ran out 6-1 home winners over Kempston Rovers Development. Kevin Butler with a hat-trick was joined on the scoresheet by Paul Jones, Adam Budek and Shaun Winconek against a lone Rovers reply from Patrick Asare. 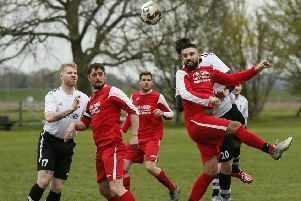 The shock of the day brought an end to Shanbrook’s five game losing run with a 2-1 victory at Renhold United to blast a major dent into United’s title hopes. Jim Burnside scored both goals against a lone United reply from Ben Brown. United drop to fifth spot and are now just three points clear of sixth place AFC Kempston Town & Bedford College who, having played less games than all of the five clubs above them, remain very much in the title race after netting a 4-0 home win over Wootton Blue Cross. Delroy Phillips netted twice, joined on the scoresheet by single strikes from Ali Ahmed and Ryan Smith. Down at the other end of the table Ampthill Town Reserves did their prospects of beating the drop a world of good with a 5-1 home victory over bottom side Sandy. Conor Saunders with a brace was joined on the scoresheet by Jake Webster and Lyas White with an own goal bringing up the nap hand, the lone Sandy replying came from Matt Johnson. Cranfield United ended their run of five games without a win by winning 1-0 at Marston Shelton Rovers thanks to a goal from Andrew Sherratt. Elsewhere it was a share of the spoils at Stevington where the home side were held to a 3-3 draw by Ickwell & Old Warden. Joe Holyoak with a brace and Aaron Hewitt were on the home scoresheet against Ickwell replies via Conor Green, Andrew Vallom and Tom Hobbs. With M&DH Clapham Sports unable to raise a side to visit Queens Park Crescents the hosts were the duly awarded three points to take them within three points of the league title. Elstow Abbey ended their six game losing run on the road by sharing the spoils in a 1-1 draw at Old Bradwell United Reserves. Billy Mills fired the Abbey in front 20 minutes into the contest before Danny Cain evened matters up for United in the 65th minute. Elsewhere AFC Kempston Town & Bedford College took their winning away run up to five games with a 4-2 victory at The 61 FC Luton Reserves. Jesse Sidhu with a brace was joined on the Town scoresheet by Kurtis Alleyne and Kegan Roberts against home replies via an own goal plus a strike from Lee Garner. Totternhoe Reserves will now contest this season’s final after winning 2-1 at Cople & Bedford SA. Joe Smith bagged both goals against a home penalty reply from Paul Nigro. Wixams are now four points clear in Division Two after taking their unbeaten sequence to seven games with a 2-1 home victory over Houghton Athletic. Iain Hall and Charles Collier netted the vital goals against one in reply from Al Mohayaldeen. Whilst with Potton Town unable to raise a side to visit Riseley Sports, the duly gifted three points now sees the Sportsmen sitting in second spot after Cranfield United Reserves fell to a 2-1 home defeat at the hands of Lea Sports PSG who still remain unbeaten on the road this season. PSG’s winner came right at the death via Jordan Yearwood who was returning to the PSG lineup for the first time since sustaining a serious early season injury. Joe Hennem netted the other PSG goal against a lone United strike from Antonia Ricciardi. Elsewhere, Caldecote Reserves claimed their first away win of the season with a 1-0 victory at AFC Oakley M&DH Reserves thanks to a goal from Adam Legate. Flitwick Town Reserves are now unbeaten in their last eight starts after drawing 2-2 at Sundon Park Rovers. Ben Pincher and Ethan Tenn were on the Rovers scoresheet against a Town brace in reply from Liam Keane. With Marston Shelton Rovers Reserves having finished their season, their hopes of lifting the league title vanished after Renhold United Reserves took their unbeaten run to 13 games and climbed to the top of the league with a 4-1 victory at Caldecote A.
Justin Loadman scored twice, joined on the scoresheet by Michael France and Ben Burns, against a lone home reply via Tony Norman. However, with two games on them and just two points adrift are third place Bedford Albion after they won 2-1 at Wootton Village to duly take their own unbeaten ways up to 10 games. This seventh consecutive win sees them as firm title favorites. Paul Babbington and Vinny Mattu were on their scoresheet against a lone Village reply from Nick Burraway. Elsewhere, Shefford Town & Campton A ended an eight game losing run with a 4-0 home victory over White Eagles. Lewis Littlechild with a brace joined on the scoresheet by Michael Castle and Liam Chalkley. CS Rovers retained their unbeaten away record with a 2-0 victory at Clifton and are now perhaps just one win away from lifting the league title. Luke Roddy and Daniel Gallagher netted the vital goals. Despite climbing above Clifton into second spot, Henlow Reserves in effect lost ground on the league leaders when held to a 1-1 home draw by Harlington who are now unbeaten in their last five starts. Charlie Willison was on the home scoresheet and Farrel Whitman replying for the visitors. Elsewhere, bottom of the table Lidlington United Sports claimed just their second victory of the season with a 3-0 home win over Dinamo Flitwick. Tom Staples, Rob Foot plus an own goal did the damage. Flitwick Town A will now face a quarter final tie at Marston Shelton Rovers Reserves after winning 4-1 at Sandy Reserves. Jack Garnish, Kevin Higby, Max Gareth and Mitch Walker netted the Town goals against one in reply from Steven Wilson.